Nazi Storm Troopers! In Seattle? Well, we can count the folks at Jewish in Seattle Magazine (JISM) among those who not only hold negative stereotypes of police officers, in this case, Seattle police officers, but also commit those stereotypes to print and illustration. It would have been bad enough if the repugnant image they used portrayed generic cops, but the officers’ uniforms have SPD patches. Doing so, they declare their ignorance of and contempt for Seattle’s police officers to the world. Now, before some leftie includes anti-Semite on the list of invectives we on the right endure whenever we attempt to express our opposing views, my recent Ancestry.com DNA results showed a smidgeon of “Eastern European Jew.” I had no idea. How did I receive this news? I embraced it with the same pride that I embraced my previously unknown “drop” of “African” blood, my unexpected modicum of Scandinavian and Irish extraction, as well as the other 90% of my white privileged, “European” heritage. Why should any portion of my racial and ethnic heritage offend me? It doesn’t change that I am 100% American! What sort of leftist bubble must she live in to believe Seattle cops would commit mass murder? Oh, right. Seattle. Does she really believe that American police officers of 2017 equate to German police officers of Nazi Germany? Does she truly believe Seattle’s men and women, sworn to protect their communities and uphold the U.S. Constitution, would obey an order to take the healthy men as slaves and then murder the rest along with their wives and children? Really? This is an example of academic, theoretical, historical (or hysterical) quackery. And what is she implying about who exactly might give such an order? Is there anything even remotely on the political horizon about the new Republican administration that would give, lucid, rational, and critical-thinking human beings the notion that such an order is conceivable? And speaking of critical thinking, I served Seattle as a cop for about 22 years, most of it on Capitol Hill, probably the most diverse neighborhood in the city. Of course officers use critical thinking on the job. A cop can’t operate properly without it. However, leftists characteristically reject critical thinking. That’s why some of them (see below) find it so hard to see it in others—especially cops. Their bigotry toward law enforcement won’t let them. Think about how elitist this sounds. It’s as if the lieutenant is talking about teaching kindergarteners, not professional, sworn police officers, making them feel accomplished because they managed to find the “correct” (according to the indoctrinators) answers all by themselves. The audacity is stunning. I remember this teaching philosophy was in effect when I was forced to participate in leftist political indoctrination. It was based on the PBS program, Race and the Power of Illusion.” While there was some valid information and factual history, the “training” conflates institutional racism of the past with today’s America, which they skew to fit their narrative of a currently uber-racist society. Regarding, “We want them to come away with the takeaway themselves,” I remember noticing the same thing while attending my political indoctrination day camp. In fact, soon after the training, I wrote about my experience. I phrased it something like this: I felt like we were cattle being herded toward predetermined conclusions (I’m speaking literally: They asked questions and then had us get up and gather into groups according to our answers). Whenever officers offered opinions that didn’t fit the narrative, our instructors would stop or deflect the discussion in another direction. So much for critical thinking. 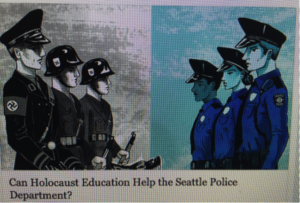 Jewish in Seattle Magazine should be ashamed of marginalizing the memory of the holocaust by attempting to make such a bizarre comparison as Nazis in pre-war Germany to Seattle police officers in modern America. Is it just me, or does anyone else believe JISM owes the good men and women of the Seattle Police Department an apology for insinuating they could become Nazi storm troopers? Charlottesville and Durham and Hate… Against Cops! 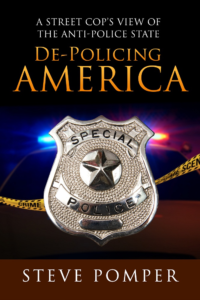 Two recent news stories bring up some observations regarding the public’s view of law enforcement. First, the repulsive white supremacists—Nazis and KKK in Charlottesville, VA. and second, the nearly as repugnant radical, leftist agitators in Durham, N.C., including, the radical leftists Workers World Party, Democratic Socialists of America, and ANTIFA (anti-First Amendment… oh, I mean anti-fascists—yeah, right!). Much derision has been heaped on the cops’ handling (or not handling) of the riots in Charlottesville, which resulted in the tragic death of a young woman at the hands of a mob of despicable white nationalists. Even some conservative commentators are critical of the cops for not intervening in the violence. People need to remember something: it’s not the cops on the riot lines who decide when to act. Those officers were no doubt fighting with every molecule of their beings to tamp down the instinct to act. Police officers at potentially violent scenes like this, planned controversial events, are most often given orders for conduct and rules of engagement before being deployed. If officers are not acting to stop rioters, it’s because politically-driven superiors have ordered them not to act. I know it happens in Seattle, too—a lot. In Durham, the cops also “failed” to act when protesters took it upon themselves to destroy public property and tear down a Confederate monument. Now, I have no love lost for the Confederacy that fought to preserve the vile institution of slavery. Think about it. I’m a libertarian! I believe in the sovereignty of every individual human being. In America, just because some piece of property offends you, you don’t get to destroy it. For example, in Baltimore, authorities removed Confederate statues, but they are being reinstalled at nearby Civil War battlefields. This form of display is in a much better context, anyway. Rather than being publicly displayed in a town common or in front of a public building, which is an implicit act of honoring something or someone, the statues now serve a legitimate historical purpose: to remind us of what can happen when some Americans ignore the rule of law and a nation splits apart. President Trump has suffered from asserting there were good and bad on both sides. Frankly, I’d like to hear more about what he meant by the “good” on the white nationalist side. But President Trump is infamous for words coming out differently than from what he’d intended. However, that anti-cop sign and chant, and the groups’ commitment to ending America as it exists, verifies the “bad” on each side comment. Equating the KKK and fascists with America’s cops is absurd, but some, even in the mainstream left, tolerate or accept, or, even further, endorse this notion. There seems to be a noteworthy difference between right and the left. The left attempts to conflate white nationalists with all Republicans, conservatives, and Trump supporters. The problem is all of these right-wing groups routinely condemn Nazis, the KKK, and other white nationalist groups. To the contrary, the left, including the Democratic Party and a Democratic President, respectively, invited the mother of a robbery suspect who assaulted and then tried to take a police officer’s gun to their national convention and radical minority groups like BLM to our White House.